Minor injuries around the house are quite common, and knowing how to take care of them can cut the risk of small scrapes and bumps turning into more severe injuries. Having a basic first aid kit is also a must for every home and car. This will help you to attend to unexpected scrapes and bumps, easily and immediately. Treating these minor injuries at home is called basic first aid. Always have a list of emergency numbers close by if the injury is serious. Sandra Oliver OHS coordinator for the Emergency Medical Services in the Western Cape says that the most common injuries that occur at home are lacerations, scrapes as well as steam burns. She cautions that the most common mistakes people can make are to put stuff on open wounds that aren’t advised or prescribed. Although we try to avoid burns at all cost they are unavoidable. You get burned by taking things out of the oven, off the stove, when you are having a braai or even reaching over the kettle just as it boils. When treating a burn don’t fall back on the Old Wives tale of rubbing the burn with butter or even Vaseline. “You can worsen the injury”, says Oliver. “It’s advised not to put anything on a burn wound unless it’s a burn shield, if not just running tap water”, she adds. The first thing to do when treating a minor burn, if the skin is unbroken, is to stop the burning process. Cool the heat down. Pour cold water over the burned area or place the area under a running tap for 5 minutes. Don’t use ice or ice water as this can damage the skin tissue even further. Don’t apply butter, Vaseline or oily remedies as the grease in these products might slow the release of heat. The retained heat can cause more damage. If the skin is unbroken after you have cooled it down you can apply a burn shield then cover with gauze. Don’t puncture any blister that might form. Minor burns will usually mend without further treatment, but if it hasn’t healed in two weeks or is accompanied by other symptoms, you should see your doctor. Sprains and strains are very common injuries. It can affect the soft tissue around joints and can affect the mobility of a joint, ligament or muscle. R for rest – rest the injured part until it’s less painful. I for ice – wrap an icepack in a towel and apply to the injured area for at least 20 minutes at a time for four to eight times a day. C for compression – support the area by wrapping it with an elastic compression bandage. E for elevation – If possible raise the affected area above heart level to reduce the swelling. If you suspect that the injury is a broken bone treat it the same as a sprain and go to your nearest emergency centre for treatment. occasionally results in mild bleeding. To treat the scrape, clean the area with water. You can cover the area with an adhesive plaster. Mild bleeding will usually stop on its own, but more severe bleeds will more often need help to stop. If a cut is bleeding a lot cover the wound with gauze or a cloth and apply direct pressure on the cut. If the gauze or cloth becomes soaked don’t remove it, apply more layers. The gauze or cloth will help clots to form to stop the flow of blood. If the bleeding can’t be controlled seek immediate emergency medical attention. We all have a nosebleed from time to time and they are commonly caused by allergies, dry or cold climates, nose picking and even forceful nose blowing. We all have the urge to throw our heads back when our noses start to bleed, but to stop a nosebleed you should actually lean forward. To help a person or a child with a nosebleed have them sit and lean forward. Don’t have them lean back as the blood will run down the throat. Have them firmly pinch the soft part of the nose just below the bridge (upper bony part) for a few minutes. If the bleeding does not stop in 5 minutes, hold the position and continue pinching the nose. Seek medical attention if the bleeding persists or can’t be controlled. sect bites. Some are unfortunately more prone to be bitten by fleas or mosquitoes than others. Some insects can also produce single or multiple bites, fleas, for instance, may produce multiple bites while a mosquito might only bite once. 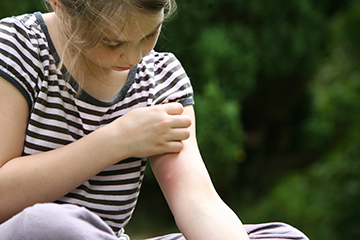 Insects don’t only bite but can also cause skin irritations. Treat insect bites by relieving the itch. Wash the area with soapy water and apply an antihistamine cream. Try not to scratch as the skin can become irritated, it can break and become infected. Bee stings, on the other hand, can be very painful or even deadly, especially when someone is allergic to the venom. It is important that people who are allergic to bee stings get rapid medical attention. Get the stinger out by scraping over it with a plastic card (like a credit card). Don’t use a tweezer as you might squeeze the stinger and release more venom. Wash the area with soapy water. Use a cold pack to reduce swelling at the site. Don’t put the cold pack directly on the skin, but rather wrap it in a cloth to keep the skin from freezing. You can take an antihistamine tablet or syrup to help with the itching and swelling. Give the person a painkiller as bee stings can be very painful. Remember never to give a child medication containing Aspirin. Keep an eye on the person who was stung. Look out for hives, redness or itching in other areas of the body, and shortness of breath. If the person is known to be allergic to bee stings, use their EpiPen to prevent anaphylaxis, an extreme or potentially life-threatening allergic reaction. The EpiPen contains Epinephrine, a medication that is used to treat such a reaction. Call for emergency assistance if there is no change in the person's condition. Please note that basic first aid is only intended to help with minor injuries. For major injuries contact emergency services or get to your nearest emergency medical centre. It’s important to have first aid training to be able to assist with serious injuries at home and to recognise incidents like choking, heart attacks and strokes.